Welcome to Paint & Distress! Interior decorating is a reflection of personality, creativity and distinctive style. It's a form in which people can truly express themselves, and being part of these expressions is a passion of ours! We believe that everyone has the ability to create a one of a kind design concept, so let us be a part of your vision with our timeless furniture and home decor. Once again we were invited to participate in the Refreshed Furniture Pop Up at the Home Show. It was another great weekend! We had so much fun meeting everyone who stopped by the booth, and catching up with the other local furniture artists. The highlight of the show had to be our spotlight on CTV news, it was such an incredible opportunity to promote both ourselves and the show! We've got some exciting news! We are relocating to our main workshop in South Mountain, which is an 1870's church - talk about character! Having the store in Merrickville has been a fantastic experience but we do hope you will love the chance to see us in action and not just behind a desk! We will still have pieces available for sale which will be listed here on the website and available for viewings by appointment until further notice. The custom refinishing side of the business has really taken off so the move will allow us to really focus on this! We want to thank everyone who made our time here in Merrickville so successful - it has been an amazing few years! We are so happy about this next chapter and can't wait to show you all some sneak peeks of the new space - so stay tuned! It was another amazing weekend at the Ottawa Home and Remodelling Show, where we took part in the Refreshed Furniture Pop-Up for the second year. We got to talk to so many lovely people, and got to meet and catch up with other furniture artists in the area. There were so many beautiful pieces to be seen, it's so inspiring to see the talent and passion out there!! Can't wait for next year!! We're full into the Christmas spirit this year and we have lots of unique holiday decor as well as one of a kind gifts for your friends and family! Handmade wooden signs, pretty silverware, vintage carved wooden santas, and so much more! Give the gift of a beautiful home this year, to either your loved ones or yourself!! Merry Christmas and a Happy New Year!! Words can not express how excited and honoured we are to be part of the newly renovated Canadian Science and Technology Museum! 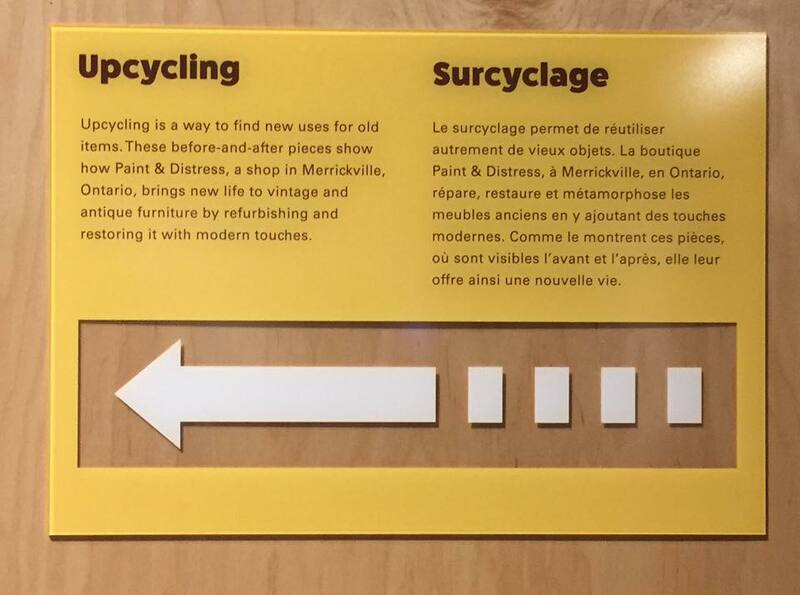 Check out these pictures of our up-cycled display located within the "Technology in Our Lives" exhibition. 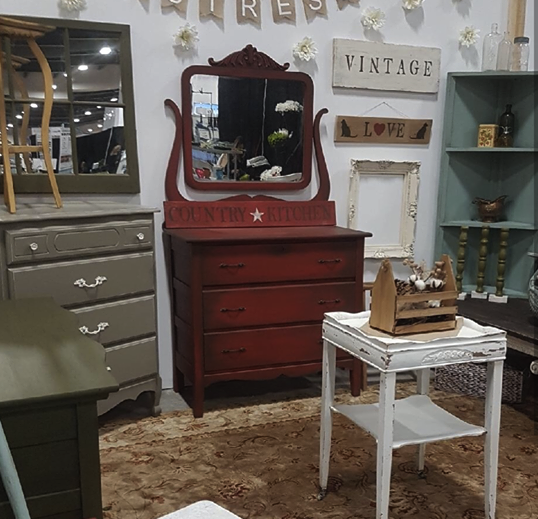 Here were are showcasing before and after pieces using fantastic vintage and antique furniture that are refreshed in a variety of chalk paints including Annie Sloan! Truly an amazing experience, we are beyond thrilled!! We were so happy to be able to participate again at the 5th Annual Refreshed Furniture Pop Up Shop, hosted by Katrina from Malenka Originals. 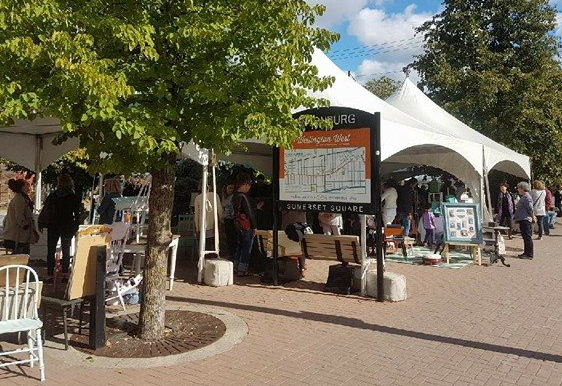 We lucked out with some absolutely amazing October weather and we had a ton of fun interacting with the other artists and of course everyone who came by!! The day was a huge success so thank you all!! Summer is just around the corner and that means its time to start enjoying your outdoor spaces again!! 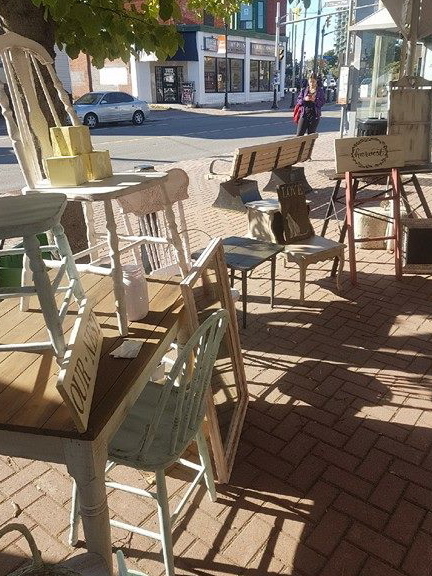 We've got old chairs, wagons, tables baskets, signs and more that will make lovely additions to your garden or porch decor!! This year, bring the indoors out and treat yourself to an outdoor oasis that is a true reflection of your personal style!! 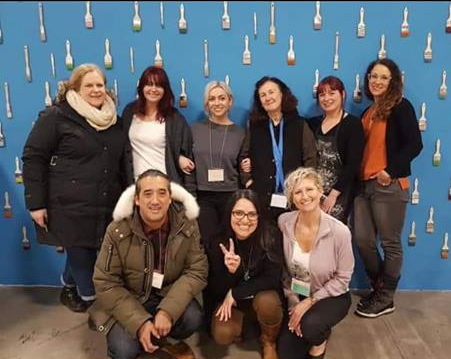 We recently had the chance to take part in the Refreshed Furniture Pop Up at the Ottawa Home and Renovation Show..such a great opportunity!! We were invited by Malenka Originals along with some other super talented artists...you wouldn't believe the amazing assortment of pieces there!! It was great to see each artists unique spin on things. We had a great time meeting new people and can't wait for the next event!! 2017 is here and there's no better way to start off a fresh year than with positive change! This applies to all things in life, one of these being your home! Why not have every room in your house be a unique creation? Why not think of your house as a canvas and your furniture and decor as the paint? Colour and texture can transform a plain space into something artistic and meaningful! Lets make it happen!! Think outside the box this year and let us work with you! A one of a kind furniture piece is always conversation worthy and can create a big visual impact in an otherwise simple design! Antique pieces with ornate details can add tons of interest too! Playing with old and new is key. Check out our furniture pieces to get your new look started, and if your not seeing what you want, message us and we will work with you! It's time to make your home as beautiful as you are!! Happy New Year!! Time to get cozy and switch out your light summer decor for some rustic woods, deep reds, golden yellows, and anything that makes you feel like curling up with a hot drink and a good book!! We just love this time of year - summer was spent outside, but the fall allows us to refocus our indoor decor. Let us help you make your space somewhere you want to relax, host holiday parties, and find refuge from the snow!! Summer's Here!! Let's make your space something worth talking about!! Check out some of our lovely nautical inspired pieces to create a coastal beachy feel in your home!! 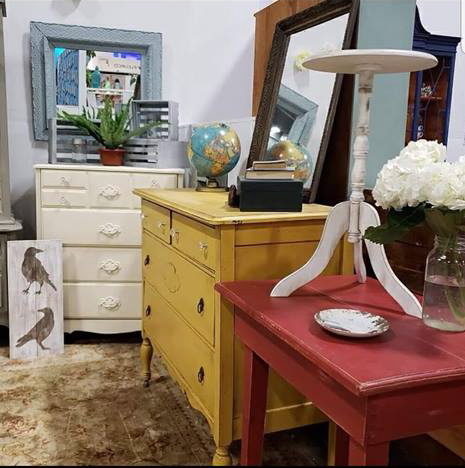 Reds, navy blue's, and whites are our main focus here, some pieces include our rope handled dresser, navy blue coffee table, and assorted painted farm chairs, and much more! If you haven't been to Merrickville before, this is definitely the season to come visit!! With events happening weekly, sightseeing at the locks, tons of boutiques, specialty shops, and patios, theres something for everyone!! Hope to see you all soon!! Get inspired for your spring decor with the soft pastel colours of our new pieces! Most of these were created with the thought of nursery designs - so we wanted to use lots of light pinks, antique white, and powder blue tones. With Easter around the corner, many of these can be incorporated in your seasonal decor as well! Happy New Years!! We hope everyone had a wonderful holiday season!! We are SO excited to announce that we officially opened a boutique in Merrickville, ON as of May 16, 2015, so please come check us out at 108 St. Lawrence Street! We are in the big stone building on the corner. We showcase a beautiful selection of hand painted furniture such as chairs, tables & accessories. We also have a wide range of mirrors, chalkboards, wood signs, art & much much more! If you've been to Merrickville before, then you already know how fantastic and quaint the town is...it's the perfect way to spend an afternoon! There is tons of shopping, great restaurants & plenty more!! So if you're in the market for some new home decor, buying a gift, or just treating yourself to something special, come check us out in store!